Here’s something funny: For this pregnancy, I actually went back into our archives to see this post on my pregnancy workout modifications from the first time around. Because, 1) baby brain — meaning I seriously couldn’t remember what I modified last time and when; and 2) I’d like to say that there are a lot of resources out there on working out when carrying twins, but there’s really not much there for women who are already fit (beyond the usual advice to not overdo it, avoid contact sports or anything with a fall risk, drinks lots of water, and make sure you can talk during workouts). So, I referenced that old post, talked to my OBGYN (which everyone who’s knocked up — multiples or not — should do, because we’re all different), and listened to my body big, big-time. Speaking of big-time, this pregnancy is showing like that — and therefore, I changed up my workouts to not only be mindful of my exhaustion and nausea (exercise should make you feel better, not worse), but also to work around my bump that became constant and undeniable starting at around 10 weeks. Again, let me stress: this is what I did and what worked for me. I hope that it’s helpful for others as an example of how things can be modified. But! Every mama and baby (or babies) are different, so talk to your doctor, listen to your body, and adjust as YOU need to. 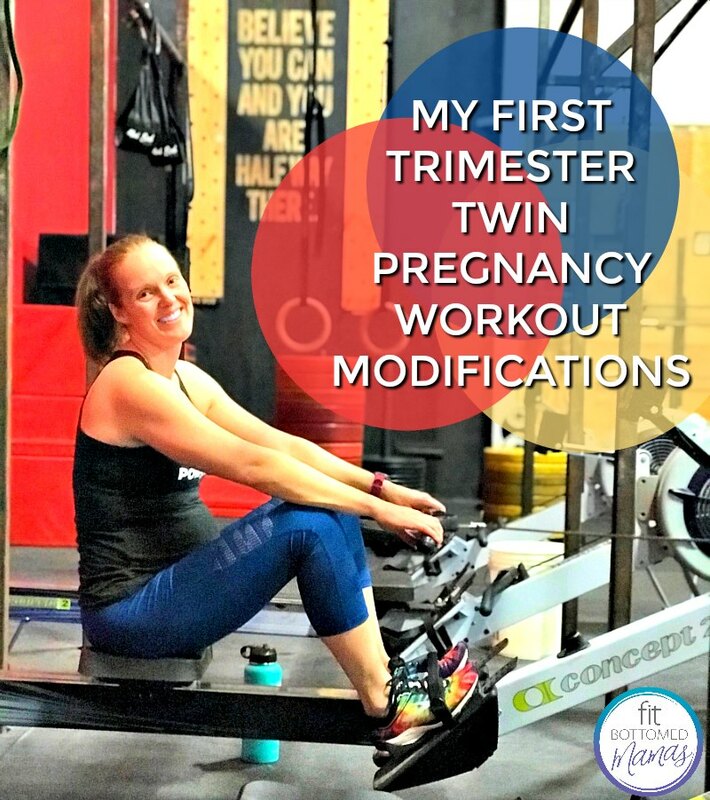 So, with that, here are my twin pregnancy workout modifications for the first trimester! Weeks 10-12: By this time, my bump was basically second-trimester sized so, with all that extra weight, workouts REALLY started feeling different and harder. I was still hit with a lot of nausea and fatigue, so again, just two short workouts a week (plus some easy dog walks here and there as I felt like it). Week 13: In attempts to avoid preterm labor (yes, even this early — especially since I’m of “advanced reproductive age”), my OBGYN nixed all high-impact activities for me. But! At week 13, I started getting a little bit of my energy back and wanted to eat more than just potato chips and Rice Chex, so, that was nice — and my dog was happy I had a little more pep in my step for walks. And, here’s what I did with modifications! Note: It was important for me to not only take the intensity down, but also to make the workout more full-body since I was only getting to the gym twice a week. Thanks for tweaking it just for me — or the three of us — Sheryl! 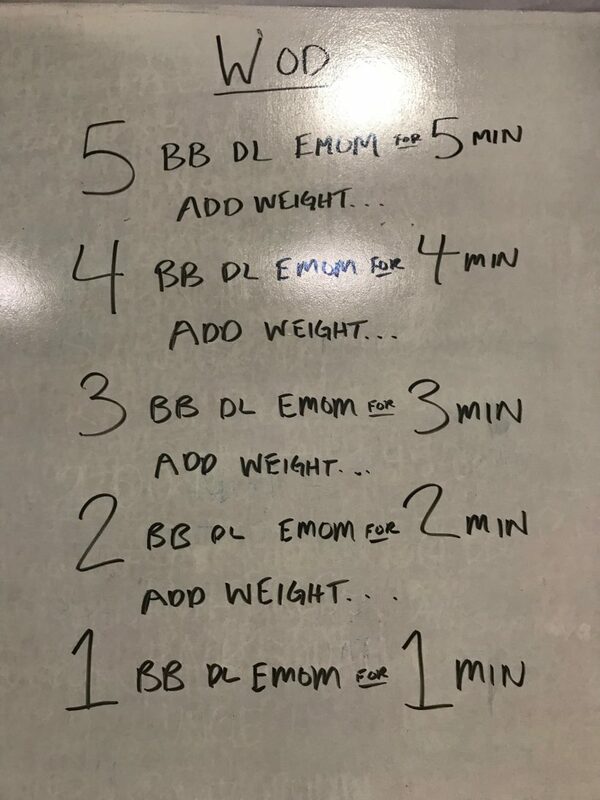 Translation: I followed the original workout structure time-wise, but instead of doing only deadlifts, for the first five minutes I did 10 deadlifts at the top of every minute, then for the next four minutes I did 10 dumbbell push presses at the top of every minute, then for the next three minutes I did 10 body rows at the top of every minutes, then for the next two minutes I did 10 sit-ups on a stability ball at the top of every minute, and then, I did 1 minute of max kettlebell swings to finish it off. 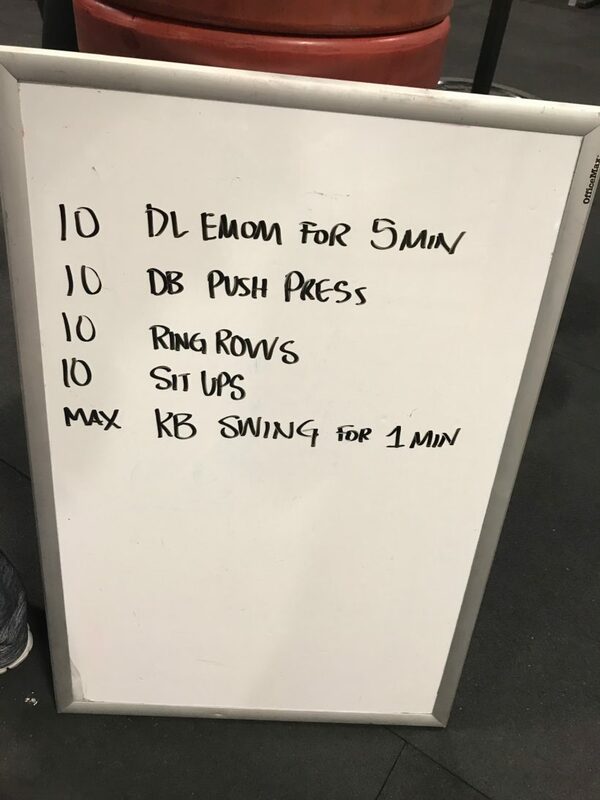 Fifteen minutes of fun — and I used weights that allowed me to perform the moves with good form and without getting totally and completely out of breath.